This album marks a new direction for Australian Christian rock music. TRAFALGAR STREET was a labour of love for Revive, with producer David Nicholas (Delta Goodrem, George, INXS, The Veronicas). 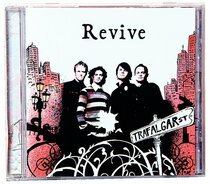 The CD title is based on the band's location at Trafalgar Studios in Sydney, which has accommodated Revive as office space, rehearsal room and studio since the band went full-time in February 2006. The songs on this album speak of the hope we have in knowing Jesus when tackling hard decisions, and the desire to be changed by God. Including the long-awaited and popular song 'Losers', this album is rock!